Tampa, Florida, is one of the fastest growing cities in America. But one development in particular is set to catapult it forward more quickly than any other. Developer Strategic Property Partners (SPP) is planning a roughly 50-acre, 9-million-square-foot, $3 billion, mixed-use project on the south side of the city’s downtown that will employ more than 15 architecture teams, designing more than 20 buildings. The first phase is slated to be complete by the end of 2020. While the full team will be announced next month, confirmed architects include Morris Adjmi, COOKFOX, and Alfonso Architects, and landscape architects Reed Hilderbrand. Master planners include David Manfredi of Elkus Manfredi Architects, Jeff Speck of Speck & Associates, and David Dixon of Stantec. 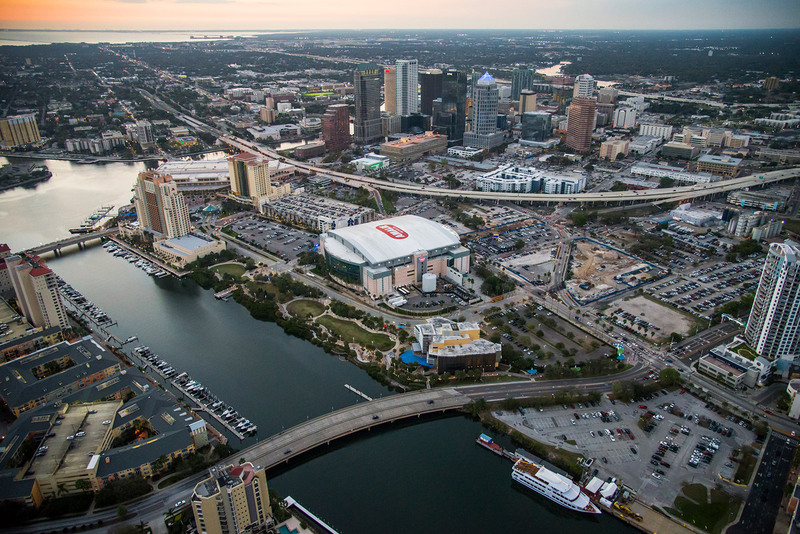 Currently the site, edging the Hillsborough River and other local bodies of water, is a warren of oversized roads, parking lots, empty warehouses, and some lonely-feeling, but important, buildings like the Tampa Convention Center, Amalie Arena, Tampa Bay History Center, and the Florida Aquarium. In order to create a more vibrant, urban environment, the team, said SPP CEO James Nozar, is paying careful attention to elements like walkability, architectural and programmatic variety, sustainability, landscape, and public space. A dizzying amount of uses include over 2 million square feet of corporate office space, 200,000 square feet of creative and tech office space, a 320,000-square-foot facility for the University of South Florida Morsani College of Medicine, a 400,000-square-foot medical arts building, 5,000 new residential apartment and condominium units, 750,000 square feet of new retail and cultural arts uses, a new arts pavilion, two new hotels, and the renovation of the existing Marriott Waterside Hotel & Marina. The project, added Nozar, is pursuing WELL Building Certification, focusing on human health and wellness elements like fitness, light, and comfort. SPP is a joint venture between Cascade Investment LLP (Bill Gates’s investment fund) and local businessman Jeff Vinik, who owns the Tampa Bay Lightning hockey team. The city of Tampa has pledged to chip in $100 million for the site’s infrastructure, including new and updated roads, sidewalks, water, sewer, and park spaces, confirmed Bob McDonaugh, Tampa’s economic opportunity administrator. “They have very ambitious plans and we’re very supportive of them,” said McDonaugh. “It’s an interesting opportunity; instead of doing this piecemeal, it seems to make sense to do this all at once.” Pending approvals, building is set to begin next spring.